The All-Party Parliamentary Group (APPG) on General Aviation has warmly welcomed a commitment by the Secretary of State for Communities and Local Government, Sajid Javid MP, to revisit Government planning policy in relation to airfields. 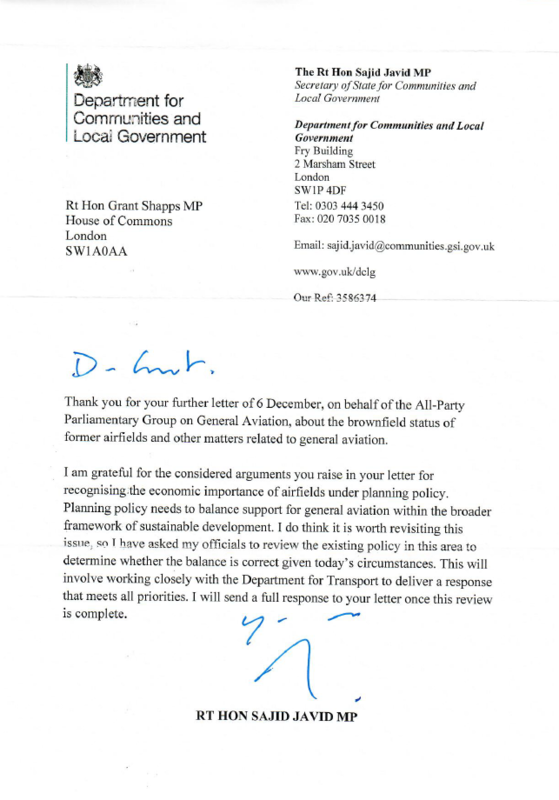 In a positive reply to the All-Party Group’s letter of 6th December 2017, Mr Javid said he was ‘grateful for the considered arguments’ raised by the group for recognising the economic importance of airfields under planning policy. Mr Javid said he has asked officials in his Department, which is responsible for setting national planning policy guidelines, to review the existing policy in close liaison with the Department for Transport. The full letter from the Secretary of State can be found below. Commenting on Mr Javid’s response, Chair of the all-party group Grant Shapps MP said: “No Whitehall department is more essential to the future of General Aviation than the Department of Communities and Local Government. However, up until now, that department hasn’t grasped the connection between planning, airfields and the very survival of one of the UK’s most vibrant sectors – aviation. This latest letter from the Secretary of State is therefore very significant indeed and the All-Party Parliamentary Group on General Aviation strongly welcomes and appreciates the Secretary of State’s thoughtful response to our arguments on strengthening planning policy on airfields.